Monica completed her community work project at Wedge Gardens in Whitney Gardens near Lyndhurst, interviewing 100 people at the treatment centre to determine the needs within the community. “The most reoccurring need was the need for more sporting activities which is why I proposed implementing basketball into the current programme. The aim of this activity is to enhance participation, to create cohesion between patients and it emphasises the importance of teamwork within the treatment centre,” she says. Darryl Smith, owner of ALK Locksmith and Dees Maintenance, offered his services and expertise by designing the basketball court at no extra cost to Wedge Gardens. 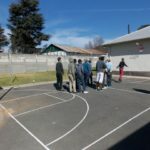 Adèl Grobbelaar, the manager of Wedge Gardens, explains that the basketball court was painted on a tarred road at the back of the care centre’s kitchen. Wedge Gardens purchased the hoops and balls and on July 11, an opening match was played in front of an audience of staff members. Basketball now forms part of the centre’s daily activity programme. “People undergoing treatment either actively play basketball or act as linesmen or fielders. It is vital for them to get exercise and develop an interest in different kinds of sport in order to foster healthy community participation post-Wedge Gardens,” says Adèl. “If someone is too unfit or does not have ball sense, therapists will detect it immediately and intervene. Participants are motivated to keep on trying. With practise, the brain forms new pathways as news skills are developed. “Therapy doesn’t work magic immediately; often people with substance abuse problems manipulate and deny their shortcomings. Drugs offer immediate gratification but we are trying to combat this and teach other coping methods though our holistic programme,” says Adèl. The occupational therapy department is at present designed an obstacle course on the property as well, and a volleyball court was built a few years ago and is very well utilised. 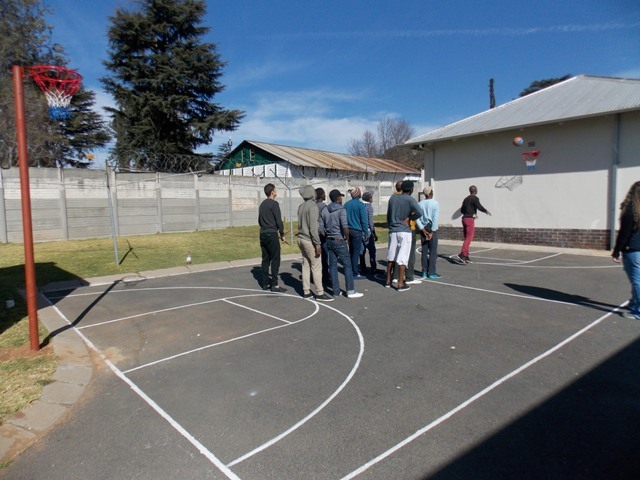 “I would like to extend my gratitude to Rand Aid Association and Wedge Gardens for allowing me the opportunity to turn my vision of a basketball court into a reality. The support and guidance that was given to me during this project was greatly appreciated,” says Monica. For more information on Wedge Gardens, call 011 430 0320.